Last week, we’ve covered the 10 Moisturizer Selection Tips. This week, (as promised! ), I’ve compiled ingredient listing for common moisturizers found in pharmacy (in Singapore/Asia as some brands are marketed under different brand names in the US/UK). 1st generation moisturizers are occlusive – these act as a layer to prevent transepidermal water loss (TEWL). These ingredients are petrolatum, mineral oil, paraffin and triglycerides. Creams/ointments with higher concentration of these are sometimes termed ‘intensive’, ‘suitable for very dry skin’ as the ointment does not evaporate as quickly as lotion but it often leaves a stain on clothing or doesn’t feel as comfortable as lotion. 2nd generation moisturizers are humectant – these are sometimes referred to having natural moisturizing factors (NMFs) as they can pull moisture from the environment to the upper layer of skin (and also from inner layer of skin to the upper layer). These ingredients include glycerin, hyaluronic acid, sodium salt of pyrrolidone carboxylic acid, sorbitol, lecithin, panthenol, salicornia extract, amino acids and urea. 3rd generation moisturizers have skin repair properties – often a combination of both occlusive and humectant, these moisturizers include ingredients that help to repair the skin barrier, either by replacing lost skin components (ceramides and skin lipids) or reduce inflammation, itch and bacterial activity. A moisturizer’s quality is also dependent on how well it delivers these properties (stability and structure) and what ingredients it does not have (which are allergens). Safety and product quality control are also important considerations. Let’s zoom into the ingredient list of the below common moisturizers and see what we can understand they contain! On 1st generation moisturizer – The low cost emollient tend to perform mainly occlusive function, with ingredients such as petrolatum, paraffin and emulsifying agent to thicken the moisturizer. If you don’t have sensitive skin, or patch tested not to be affected by these ingredients, basic creams can help prevent moisture loss. However, if you have eczema skin, it is not suitable as these mosturizers tend to be more alkaline than our skin pH and the ingredients may irritate your skin. There is also no ingredient in these creams to help repair your skin barrier. 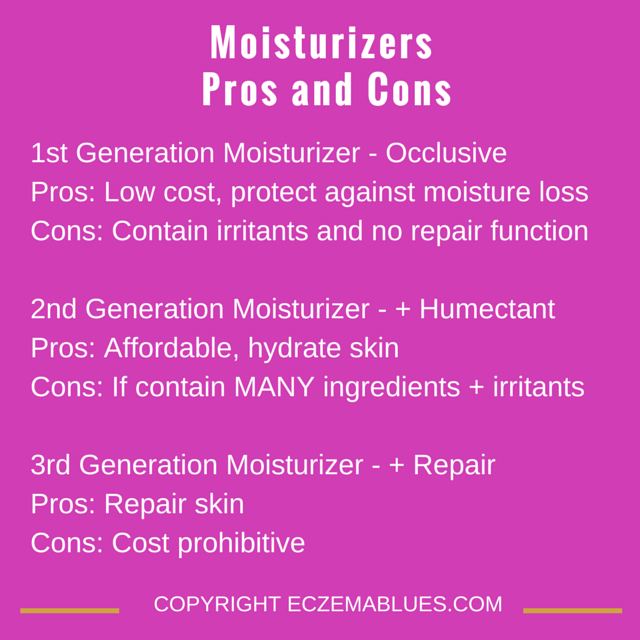 I like to look at the number of ingredients and the absence of common irritants when comparing second generation moisturizer. For the same price range, I’d prefer to choose one with fewer ingredients and less irritants to reduce likelihood of irritating my eczema child’s skin. Another way is to rotate your moisturizer (in the hope!) to reduce the duration which your skin is exposed to the irritant. Cons: Granted for the price range, you may not get ingredients like ceramides, lipids that repair your skin. But don’t choose one with many ingredients or irritants. On 3rd generation moisturizer – These more costly moisturizers are less likely to have irritants (still check though, don’t take for granted!) but whether it is worth the price is another matter. % of ingredients is not listed and the stability of how long the reparative function last is not known. Personally, I use these on weeks where my child’s skin tend to be persistently dry or itchy despite moisturizing regularly with 1st & 2nd generation moisturizer.